Barcode label maker facilitates user to generate barcode images in different size and shape according to requirement. Barcode image creator software has ability to produce colored barcode labels in jpeg, gif or bmp formats. Barcode labeling tool is useful for all type of organization like Manufacturing, Healthcare Industry, Automobile Sector, Telecom Industry, Airline Ticketing, Financial Services, Inventory Management etc. Barcode image maker utility supports all major barcode formats such as ISBN 13, ITF-14, LOGMARS, MSI Plessey, Code 128 SET A, Code 128 SET B, Code 128 SET C, UCC/EAN-128, UPCA, UPCE, UPSC Stack Label etc. Barcode creator allows user to change barcode color, barcode size, background color, text font, caption color as per user need. Barcode labeling software has capability to generate barcode images by using special character (+, =, $), uppercase letter (A-Z), lowercase letter (a-z) or number (0-9). Barcode processing tool successfully creates barcode labels under all Windows OS including Windows Vista Starter, Windows Vista Home Basic, Windows Vista Home Premium, Windows Vista Business and Windows Vista Enterprise. Features: * Barcode generating software produces colored tags, printable barcode labels, ribbon for small to large scale organization. 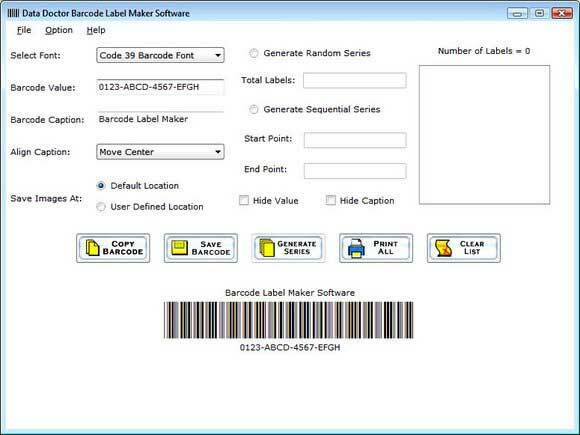 * Barcode label maker has ability to create barcode images, tags in different size according to user requirement. * Barcode creator utility generates barcodes in various formats such as Code 11, Code 39, Code 93, Code 128, EAN13 etc. * Barcode generator tool allows user to save barcode images in various formats like jpeg, gif or bmp. * Barcode label creator comes with help manual therefore anyone can easily operate software.